Kau Kee Beef Noodle Soup is one of the most popular beef noodle soup dishes in Hong Kong if not the best, it was created and popularized by a small restaurant located in Gough St just between Central and Sheung Wan MTR Stations. It’s so popular during peak times diners will have to wait long hours just to have their orders. So what is Kau Kee Beef Noodle Soup? Well its Beef Brisket Kway Teow Soup where beef brisket alongside different spices are cooked until its fork tender, it is then served in rice noodles called Kway Teow. The soup is clear, light, and savoury with hints of sweetness. Now if you are far away from Hong Kong and want to try this one out now you can with this recipe, while it might not be exactly the same recipe they use I guess it comes close, the only secret here anyways is making the beef really tender. In a pot combine beef tendons, beef brisket and leg bones, add water enough to cover the meat. Bring it to a boil and leave it boiling for 3 minutes. Drain the pot and rinse meat with running cold water to remove the scum. Set aside the meat. In the same pot (make sure it’s clean of scum) add a small amount of oil then sauté garlic and ginger until fragrant. Place the meat back together with all other ingredients except for daikon radish, pour enough water to cover meat then cover and bring to a boil. Simmer for 1 hour. Add the daikon radish the simmer for another hour, during this process add water if necessary. Using a colander separate the liquid into a separate pot and set aside the tendons and beef brisket. Continue to simmer the stock for 5 more minutes, season if necessary. Place noodles in a bowl, add some of the tendons and beef then ladle some hot soup and garnish with spring onions. 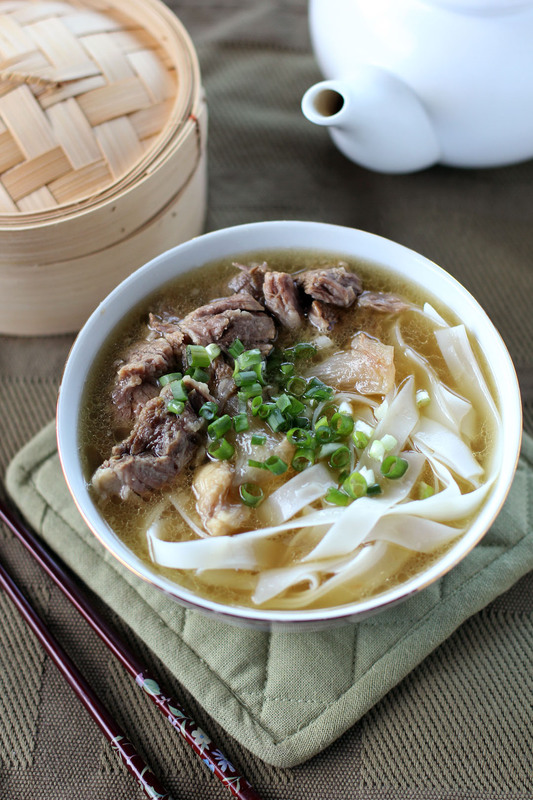 I love the combo of brisket, daikon and tendon in these soups, such a hearty dish for cold weather too! i love beef noodles.. you made me hungry raymund.. i’ll try this one for sure. I can almost taste that meltingly soft meat. I love this dish. It is made with brisket…Yum!!!! It looks super comforting and hearty — ideal for the upcoming season: Fall! Hello Ray, yes this is a very popular soup here and I have never had it so fancy as how you are serving it up today. I have only it had it in styrofoam bowls to go in a busy rush. Your soup sounds so aromatic and perfect for these change of seasons and damp weather we are having in HK this week. 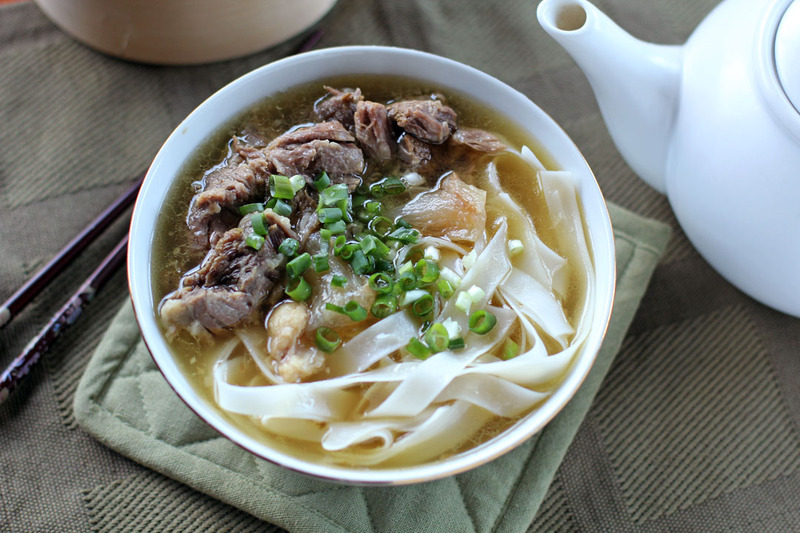 “fork tender beef” with slippery soft noodles in soup. Comfort doesn’t come much better than this ! It’s getting cooler at night and the photos of this dish totally bring me comfort… Looks so good! It’s been ages since I’ve even tasted this Raymond, so I’m going to give this recipe a go for sure. Always a sucka for the amazing aromas of garlic & ginger.